Nebraskans ask: What is real community solar? As community solar grows, solar advocates are working to ensure that these programs provide a direct benefit to participants. The latest example comes from Nebraska. Solar supporters hope a developing proposal for community solar meets a set of standards they’ve proposed. Nebraskans for Solar educates Nebraskans about solar in order to further its development and adoption. It recently set down a marker (see inset) for what the organization considers “community solar”. The group’s declaration was spurred by the development of projects across the state that claimed the title of community solar, but that varied greatly in their actual structure. “Our concern is that there’s false excitement based upon labeling a program community solar, when it has few to none of the benefits of a real community solar program,” said Jared Friesen, President of Nebraskans for Solar. Program includes public engagement in community solar projects in a variety of aspects: planning, net metering and/or virtual net metering, tax issues, financing, transfer of ownership from one community solar member to another and choice of installers. Program is based on members owning a portion or share in one or more aggregated solar installations. Program provides a return on the investment of members for duration of ownership/subscription and directly based on benefits to the serving utility. Program results in an offset in energy and/or demand charges on the consumption side of the utility bill. Note: “Energy payments” do not provide the customer with the benefit of an energy cost hedge, and jeopardize IRS treatment on tax credits and taxable income. 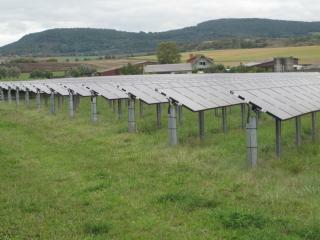 The ideal arrangement for members is generally referred to as “virtual net metering”. If retail compensation associated with virtual net metering is not acceptable for program sustainability, additional fixed charges for transmission (if applicable), distribution, and/or program management should be implemented based on true value of these services. An energy-payment based program is not satisfactory. Program results in direct ownership of solar by the serving utility or residents within the utility boundary (who may be able to claim tax benefits through stake in a community solar installation). Program should not be served by a third party utility power purchase agreement with a non-Nebraska based organization who owns and operates the installation. Program utilizes Nebraska labor, which incidentally serves public power’s state-mandated economic development function. Program expands access to solar energy to all customers and includes design measures that remove economic barriers to participation for low-to-moderate income (LMI) customers, for example no or low up-front costs. Use of “Green Fund” or other donation-based funds that do not itemize the magnitude of contribution and costs that funds are applied to. Systems whose capacity the utility intends to apply toward state mandated net metering allowances (currently requiring utility to allow net metering customers to 1% of utility average monthly peak demand). Programs that penalize or disadvantage distributed (customer owned and hyper-locally installed) solar installations connected on the customer side of a consumption meter. Nebraskans for Solar recommends you communicate expectations for community solar to your utility and strongly consider supporting programs that meet or exceed the principles of these positions. Please contact Nebraskans for Solar with questions regarding the implementation of community solar in your community. Nebraskans for Solar believes community solar projects should enable participants to own a share of the installation itself and provide a return on investment to participants. “If it’s a long term investment, then they should get the benefits that go along with choosing to pay that higher price up front,” Friesen said. Ideally, the group says, community solar should use a “virtual net metering” model. This would enable community solar participants to offset their home utility bill with the electricity produced by their share of a community solar project the same they would as if the panels were on their own roof. Nebraskans for Solar recently participated in a stakeholder session held by the Omaha Public Power District (OPPD) to discuss the municipal utility’s development of community solar. OPPD, which serves 369,500 customers, began researching the feasibility of developing a community solar project last year based upon customer desire for greater integration of renewable energy into its portfolio. Individual ownership of solar in OPPD territory remains low. There are only a few dozen net-metered systems. “We felt this way would be a good way to increase the participation in solar across our service territory,” said Tim Yager, OPPD’s Manager of Renewables. Nebraska is the only state without any investor-owned utilities. Every Nebraskan is served by a publically owned utility, electric cooperative, or municipal utility, like OPPD. This prevents OPPD from making use of the federal tax credit for solar. This means it can either build the system itself without the tax credit, or set up a third-party ownership structure where it buys the power produced by the system. While this would enable the system to benefit from the tax credit, it adds an extra layer of complexity and cost to building the system. It also makes it more likely that the solar project will be owned by an out-of-state entity. This is a point of concern for Nebraskans for Solar as this ownership model goes against a key benefit of Nebraska’s unique utility structure, that electricity generation is owned by Nebraskans themselves. Another way to structure the project would be for customers to directly own the system. Unfortunately, Nebraska’s net metering rules do not allow for “customer-generators” as they are called, to earn credit from systems that are not on the customer’s property. Solar advocates are also concerned about development of solar projects that make it more difficult for individual homeowners to go solar. Nebraska places a 1% cap on net metering credit. Widespread adoption of community solar, if it is credited toward the cap, could push individual solar owners out of the market if the electricity from these projects is counted toward the cap. Yager said that OPPD has researched other similar projects in Nebraska and elsewhere to learn from their experiences. He mentioned ensuring participants fully fund the project, not OPPD’s general customer base, and a simple billing system as two goals. The utility hopes to have the system built in 2018.